A perusal through the contributors to the Edward Elgar "Handbook on the Economics of the Internet" warmed the cockles of this dismal scientist's heart, for in it contains a number of IP economists who have dared stray into the dark waters of the Internet. Consisting of a collection of essays, the Handbook includes chapters by experts in many aspect of the digital world. As the book explains, the Internet is a series of tubes, the Internet has challenged many theoretical assumptions and has prompted a re-examining of economic analysis. The book is divided into five parts, with the key parts addressing theoretical foundations, institutional arrangements and internet architecture, economics and management of applications and services, and past & future trajectories. Not all of the authors identify as economists, which helps towards developing the book's more narrative, as opposed to an econo-scientific, tone. A chapter by Sacha Wunsch-Vincent (WIPO) looks at the economics of copyright and the Internet. Wunsch-Vicent develops a handy table which breaks down the pros and cons of the effects of the copyright system. He notes that, for example, the 'creative supply' of copyrighted works is incentivised by the copyright system, but copyright may reduce follow-on creativity by limiting access to other creative works. While the incentive effect increases the availability for consumers, copyright also increases the costs to consumers. The author notes the huge challenge of data for analysis, but ends on a hopeful tone noting that economists and governments are working towards solutions to these challenges. because he's got the right shirt. Hal Varian (Chief Economist of Google) writes on "The economics of Internet search." Noting that advertising is a 'low-yield' business, Varian describes how a shift to cloud-computing has decreased entry costs into the market. In what seems to be a general thesis that the search engine market is contestable, he also argues that users of search engines easily switch between search engines and therefore there is "robust competition" between search engines for users, and predicts a market equilibrium with "a few large competitors in any given country or language group." This argument is not convincing, as Google has emerged as the clear winner of this competition and has even attracted fines for abusing its market dominance in advertising. (In Varian's defence, the chapter is an updated version of a 2007 speech, and a lengthy publishing process may contributed to his arguments being out of date.) The rest of the chapter is more relevant, and discussions of economics are nicely detailed through a history of the development of search engines and Google's advertising model. Varian ends by pointing to the future importance of data both for business and researchers. Other chapters touch on copyright, cultural economics, cybersecurity, data and business strategy. One rather modest quote in the preface caught my eye, "coordinating and synchronising 49 authors was sometimes challenging, often took longer than hoped, but ultimately was always rewarding." It is quite easy as a reader to view handbooks such as this as simply a collection of papers. However, recent personal experience has made me appreciate the vast amounts of work that go into curating, editing and assembling such books. The editors have managed to put together a nearly 600 page book full of interesting topics by top authors, and it can't have been easy! I'm pleased to see that economists are paying more attention to the economics of the Internet. Copyright research has long-embraced the digital world and we are likely to see further investigations linking IP and the Internet (I'm currently combining trade secrets research and cybersecurity.) The Handbook is written in an accessible manner, with the bulk of the book not requiring advanced economic or maths knowledge, and is clearly a good fit for teaching. Readers interested in broadening their knowledge of economic analysis of the Internet will also find it useful. 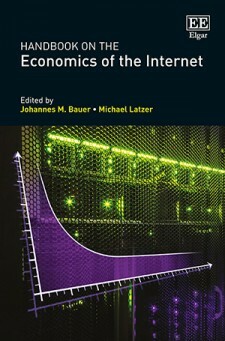 The Handbook on the Economics of the Internet, by Edward Elgar Publishing, edited by Johannes M., Bauer and Michael Latzer, is available here for £184.50 in hardback and £36 in a soon-to-be-published paperback. Rupture factor of the hardback: medium-high, nearly 600 pages. A book is protected by copyright. A book on economics is therefore an appropriate subject to review on an IP blog. No abuse here, move along.